When you take a kid fishing, the more catching the better. Understatement of the year, right? Still, it’s good to remember that kids often just want to catch something, not set a state record. 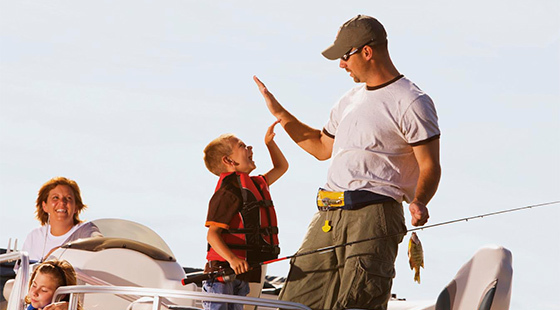 VMC®’s pre-rigged jigs will help put fish in the boat and keep kids entertained. Your best bet is to fish pre-rigged VMC jigs around docks, shorelines and weed edges where panfish are visible. 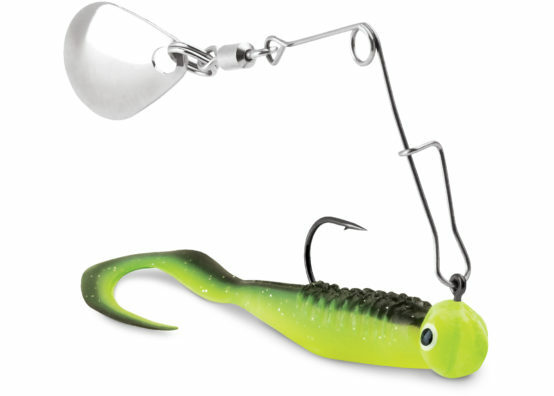 VMC’s Wingding Spin Jig fits the bill as both a bass-targeting finesse bait and as a primary panfish offering. It features an under-spinning Colorado blade and comes pre-rigged with a Trigger X® Wingding solid-core soft-plastic body. A ball bearing swivel connects the blade, allowing for maximum rotation and flash. 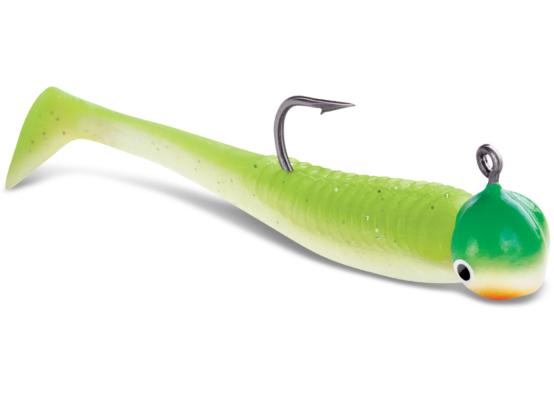 The Wingding Spin Jig is available in six color patterns: Black Chartreuse Glow, Crappie Minnow, Green Orange Glow, Pink Chartreuse Glow, Pearl White and Red Pearl Glow. They come in two sizes, 1/16-ounce. and 1/8-ounce. VMC’s Curl Tail Spinnerbait is another flashy finesse offering for bass and primary bait for panfish — with the added benefit of being weedless. 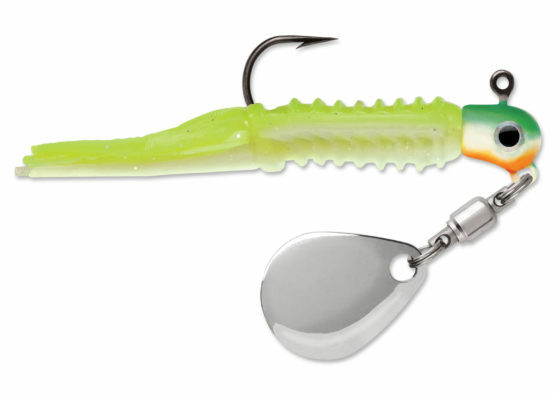 It features a Colorado blade on a paperclip-style arm swinging from the eyelet of special ball-head-type jig pre-rigged with a Trigger X Curl Tail grub body. Featuring a long and curled micro-thin tail, the grub emits a light and subtle vibration as it swims. 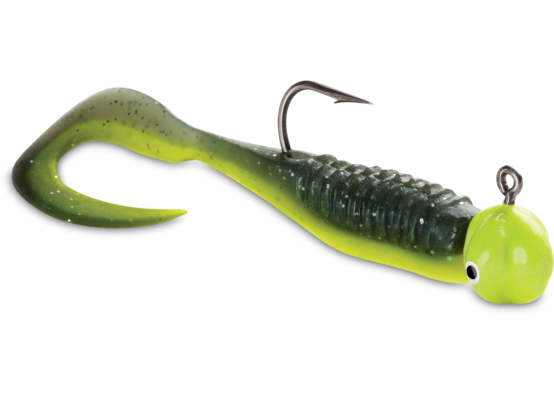 Available in 1/16-ounce and 1/8-ounce sizes, Curl Tail Spinnerbaits come in five color patterns: Black Chartreuse Glow, Crappie Minnow, Green Orange Glow, Pink Chartreuse Glow, Pearl White and Red Pearl Glow. VMC Boot Tail Jigs pre-rigged with Trigger X Boot Tail Minnows are available in two-packs. Featuring long, micro-thin mid-sections terminating in a boot-shaped tail paddle, Boot Tail Minnows swim with a light and subtle vibrating action. VMC Curl Tail Jigs pre-rigged with Trigger X Curl Tail Minnows are available in two-packs. Featuring a long, micro-thin curly tail, Curl Tail Minnows swim with a light and subtle twirling action. Boot Tail Jigs and Curl Tail Jigs come in two sizes: 1/16 oz. (with a size 4 hook) and 1/32 oz. (size 6 hook). Each features a Power Gap hook and 90-degree hook eye. Each is available in two natural color patterns — Crappie Minnow and Mayfly — and six Ultra Glow patterns: Glow, Green Orange Glow, Orange Chartreuse Glow, Pink Chartreuse Glow, Glow Chartreuse, Glow Red. Both Boot Tail Minnows and Curl Tail Minnows come in 12 color patterns: Bubblegum, Black, Black Chartreuse, Black Pearl, Blue Pearl, Bloodred, Glow, Natural (brown), Orange Chartreuse, Pink Glow, Pearl White and Red Pearl. This entry was posted in VMC and tagged Boot Tail Minnows, Curl Tail Minnow, Curl Tail Spinnerbait, Joel Nelson, VMC, Wingding Spin Jig. Bookmark the permalink.